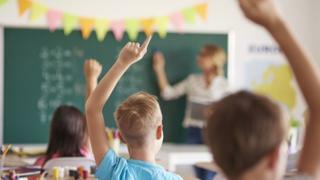 Teachers have criticised a plan to cut funding for education if the Stormont parties do not reach an agreement on forming a new power-sharing executive. Secretary of State James Brokenshire published indicative figures for a budget he would impose if the parties do not reach a deal. The proposed 2.5% cut would represent a loss of £50m from the education budget. One principal described the cut as “completely savage” and others warned that teachers would lose their jobs. How will election impact NI finances? “This is really all the political parties, plus the secretary of state, holding our children and their future to ransom, so that a political deal can be struck to restore the executive,” said Kevin Donaghy, principal of St Ronan’s Primary School in Newry, County Down. Secretary of State James Brokenshire said he had taken advice from senior civil servants and was attempting to reflect the priorities of the local parties. His intention was to “give clarity” in the absence of an executive, he said. However, two principals have said the cuts would mean teachers being put of work. Deirdre Gillespie, principal of St Mary’s Grammar School in Magherafelt, County Londonderry, said: “The only way that I can stand still, not balance my books but stand still, would be to make three teachers redundant and I simply can’t afford to run a school with three less teachers. Marie Lindsay, principal of St Mary’s College in Londonderry, also said the cut would mean “two and a half or three teachers” losing their jobs. “I’m angry,” she said. “I read that one of the decisions was to reflect political priorities. Ralph Magee, from Andrews Memorial Primary School in Comber, County Down, said schools were on an “unknown playing field”. Stormont’s finances have been under the control of a senior civil servant since the start of the financial year because the previous executive did not produce a budget. Mr Brokenshire said the totals he has set out “would not constrain the future ability of an incoming executive to adjust its priorities during the course of the year”. His indicative budget includes £42m which has not yet been allocated to departments: If all that money was allocated to education it would eliminate most of the shortfall in the department’s budget. Northern Ireland has been without a devolved government since January, when the coalition collapsed over a botched energy scheme. The late Martin McGuinness, of Sinn Féin, quit as deputy first minister in protest at the Democratic Unionist Party’s handling of the Renewable Heat Incentive (RHI) scandal. It led to a snap election to the Northern Ireland Assembly on 2 March, which saw a surge in Sinn Féin’s vote. Stormont’s two largest parties have been unable to reach agreement to share power since that date, and were warned they face either a second assembly election or direct rule from Westminster. However, Prime Minister Theresa May’s decision to call a snap election to the House of Commons made a deal even more unlikely as parties switched to campaign mode. The bill passed its accelerated passage through Westminster on Monday and is set to become law by the end of the week.